By 1984, the slasher cycle of horror films had already reached its peak and was starting a decline, as scary movie fans had been treated to a slew of masked killers stalking helpless villains. Wes Craven changed all of this with A Nightmare on Elm Street, as it brought in a supernatural angle and gave us rules on how and when the killer could attack. Craven re-visited this sort of idea with 1989's Shocker, as it gave us a killer who could travel via electricity. Craven then served as "Presenter" (whatever that is) on 2002's They, where victims could only be attacked in the dark. Craven's legacy has inspired many other movies in which very specific rules as to how and why someone could be killed. 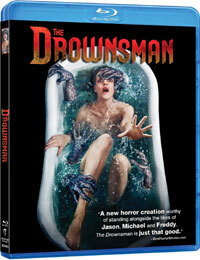 The newly released The Drownsman presents us with a killer who can strike around water. As The Drownsman opens, Madison (Michelle Mylett) falls into a lake while attending a party. In the water, she glimpses a man (Ry Barrett). Following this, Madison recurring visions of the grotesque man and a room filled with odd tank-like boxes. She becomes a recluse who is so afraid of water that she gets her fluids via IV. When she misses Hannah's (Caroline Korycki) wedding, Madison's friends -- Kobie (Gemma Bird Matheson), Lauren (Sydney Kondruss) and Cathryn (Clare Bastable) -- decide to stage a seance-like intervention. Following this, all of the women can see the man, and the begin to die horrible deaths. Madison decides that she most overcome her fear of the outside world and find out who this man is and what she wants. But, how can she be safe where there is water everywhere. If I were to tell you that The Drownsman was about a young woman who has a phobia of water (known as aquaphobia), you would probably imagine someone who doesn't like going on boats or being near the ocean. But, what if I told you that this person's fear was so crippling that they could not go out in the rain or even drink water. That would begin to border on the absurd. And yet, Writer/Director Chad Archibald, along with Co-Writer Cody Calahan, plays the whole thing straight, which leads to a very particular problem. The movie takes itself very seriously, but it becomes as things progress, it becomes more and more difficult for the audience to take the film seriously. Again, like the movies mentioned above, the movie sets up its rules quite early -- the killer, known as The Drownsman -- can only strike in or around water. But, the movie then seems to change its own rules, as, at times, The Drownsman can create water, such as in a scene in which an elevator floods for no reason. This is also one of those movies which is simultaneously overwritten and underwritten. Archibald and Calahan have gone out of their way to insert several plot twists into the second half of the film, two of which are effective when viewed in a purely subjective manner. However, the story is very poorly structured and many seemingly non-sensical events from the first half of the film do not become clear until the second half. But, this doesn't change the fact that the first act will remain a confusing mess if you don't finish the movie. The film opens with a murder of someone that we don't know and then goes right into Madison falling into a lake and then becoming a paranoid recluse. If I had been watching this in a theater, I would have been convinced that someone had the reels in the wrong order. We learn that The Drownsman has a secret lair where he likes to take his victims ("Paging Freddy Krueger...") and we learn why he's obsessed with water, but we never learn how he became a supernatural creature who is ridiculously powerful. And just when things couldn't get weirder, the movie trots out its strangest idea -- fire is the enemy of water. Shouldn't that be the other way around? Wouldn't a sponge or perhaps a Sham-Wow make a better weapon against water than fire? I kept hoping that SpongeBob SquarePants would come through and put these shenanigans to an end. But no, Madison has some industrial-strength flares to use against The Drownsman in a typical final girl ritual. In the end, The Drownsman is a weird movie. While clearly not a high-budget affair, someone obviously put some work into the lair set. And, as noted above, the script attempts to have some depth. But, the idea is so silly that the movie asks a lot of us. When Hydro-Man appears in Spider-Man comics, I always take it with a grain of salt. Placing a similar character in a horror film makes me with that the Mystery Science Theater 3000 boys could get a hold of this one. The Drownsman made me wonder who would put a bathtub in the middle of a room like that on Blu-ray Disc courtesy of Anchor Bay Entertainment. The film has been letterboxed at 2.35:1 and the Disc contains an AVC 1080p HD transfer which runs at an average of 30 Mbps. The image is sharp and clear, showing no overt grain and no defects from the source materials. While the colors look fine, I did note that some shots, most notably Madison's opening scene, are somewhat dark. The level of detail is good, and the depth works well in the lair scenes. The Disc carries a Dolby TrueHD 5.1 audio track which runs at 48 kHz and an average of 4.1 Mbps. The track provides clear dialogue and sound effects. As one would imagine, the track highlights water sound effects, and we get a lot of dripping coming from the rear speakers. The subwoofer effects enhance the attack sequences and the stereo effects show good separation. The Drownsman Blu-ray Disc contains no extra features.